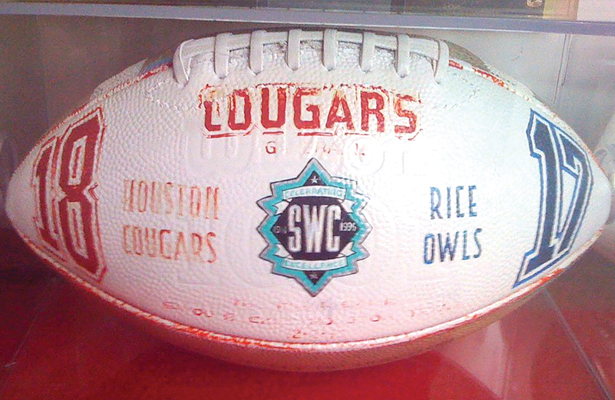 The game ball from the 1995 Bayou Bucket Classic between the Houston Cougars and the Rice Owls, which was the last football game in Southwest Conference history. So here is a topic that revolves around age. How many of you remember the old Southwest Conference? 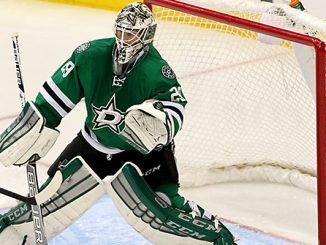 For those of us who do, there was a ton of pride in a league that primarily revolved around one powerful state, Texas. If you thought the people of Texas bragged about football to the rest of the country, the Southwest Conference was probably why. Seriously, how many other states could claim seven powerful college football teams in one state? Throw in the Arkansas Razorbacks and you had an entire conference of great football teams that were above and beyond many other conferences in the country, and the conference was primarily in one state. If you don’t remember that old conference, you have to wonder what it was like when that conference was alive and kicking. What caused it to succeed year after year? What caused its demise? The Southwest Conference was organized in 1914. Charter members included the University of Texas, Texas A&M University, Baylor University, the University of Arkansas, the University of Oklahoma, Oklahoma A&M (now Oklahoma State) University, Southwestern University of Georgetown and Rice University. Southern Methodist University joined the conference in 1918; Texas Christian University was added in 1923; Texas Technological College (now Texas Tech University) joined in 1958; and the University of Houston was accepted for membership in 1971. Phillips University of Enid, Okla., participated in the conference in 1920. Oklahoma and Oklahoma A&M dropped out in the mid-20s, and Southwestern quit after 1916. 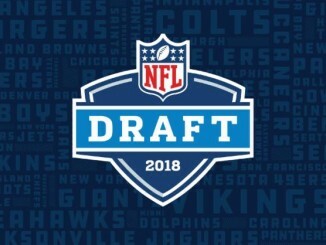 Football, the premier sport from start to finish, produced seven national champions: SMU, 1935; TCU, 1938; Texas A&M, 1939; Arkansas, 1964; and Texas, 1963, 1969 and 1970. Those three UT national titles were the gems of Darrell Royal’s 20 years as the Longhorns coach, a career which saw him post the SWC’s best winning percentage of .774 (167-47-5). D.X. Bible, who hired Royal to restore UT’s football glory just before he retired as the school’s athletic director, also earned a unique place in SWC history. He was the only man who served as head coach at A&M and UT, the conference’s fiercest rivals. Bible was 72-19-9 in 11 years at A&M (1917, 1919-28) and returned to the SWC after eight years at Nebraska to coach Texas to a 63-31-3 record in 10 years, 1937-46. Bible’s 21-year SWC coaching record was .716. The Heisman Trophy, awarded annually to the nation’s most outstanding player, was won by five SWC stars: TCU’s Davey O’Brien, 1938; SMU’s Doak Walker, 1948; A&M’s John David Crow, 1957; Texas’ Earl Campbell, 1977; and Houston’s Andre Ware, 1989. The league also produced five winners of the Outland Trophy, which salutes the nation’s outstanding lineman: Arkansas’ Bud Brooks, 1954; Texas’ Scott Appleton, 1963; Texas’ Tommy Nobis, 1965; Arkansas’ Loyd Phillips, 1966; and Texas’ Brad Shearer, 1977. In other sports, SWC schools won a total of 55 national championships. Most notable were Texas’ winning the NCAA College World Series four times (1949, 1950, 1975, 1983) and two outstanding women’s basketball champions: Texas (34-0) in 1986 and Texas Tech, led by Player of the Year Sheryl Swoopes, in 1993. The SWC boasted more than 350 first-team All-America athletes in football, basketball and baseball alone. Its track-and-field stars included three historic Olympians. Baylor’s Michael Johnson scored the rarest of doubles in 1996, winning both the 200 and 400 at the Atlanta Games to cap a career-best year in which he set world records in both races. In 1984, Houston’s Carl Lewis became the first Olympian to win four gold medals at the games since Jesse Owens in 1936 and added five more gold medals in the 1988, 1992 and 1996 Olympics. Texas A&M shot putter Randy Matson, the first ever to throw past 70 feet, won the gold in 1968 and held the world record longer than anyone in history. In the fall of 1996, the final eight SWC members scattered to their new conferences. The football season lacked excellence on all fronts until Texas, winner of a mediocre South Division, faced two-time national champion Nebraska in the first-ever Big 12 championship game at St. Louis. The Longhorns, 20½-point underdogs, stunned the Cornhuskers with their imaginative, gambling style of play to win, 37-27. Anyone who remembered the excitement of the SWC at its best sure got their kicks that day. So What Happened to the Southwest Conference? There have been many theories as to what happened to bring down one of the best conferences ever. A premiere football conference with legendary coaches and Heisman Trophy winners, the SWC produced national champions in the 1930s, 1960s, and 1970s. Despite having some of the best college athletes and ranking as a football powerhouse, the SWC fell apart when the desire to win overshadowed ethics and teams began using almost any means necessary to succeed. Though not the only conference to engage in recruitment violations, the SWC ranked as one of the worst offenders. Constant sanctions levied on the member universities by the National Collegiate Athletic Association partly led to the break-up of the SWC. Already at a disadvantage with its small regional television market, the conference’s bigger universities had their games blacked out because of NCAA violations that landed them on probation. Individual alumni boosters at some SWC universities felt that the NCAA rules did not apply to them because they had not agreed to the NCAA’s terms. These boosters paid student-athletes under the table to attend their alma maters and for their on-field performance. At one point the Southwest Conference had seven of its nine teams serving some sort of NCAA sanction that included loss of scholarships, loss of television broadcast rights, and bowl game bans. The lack of institutional control by the presidents and athletic directors kept the cheating going, and the problem went all the way to the office of the governor of Texas, Bill Clements. With the recruiting scandals and NCAA probations for cheating that cut television revenues, the conference’s athletic departments could not meet their multi-million dollar budgets. Every year, universities compete to obtain the best high school football talent on national signing day. The process involves finding the blue-chip student-athlete who will sign a football scholarship with the hope of improving the school’s football program and winning a national championship. National signing day also concludes the recruiting process for that year’s class, and universities anxiously await their chance to find and attract the nation’s best athletes. SWC alumni boosters who sought to circumvent the system found out that money spoke louder than any recruiter ever could. The Southwest Conference was made up of the “haves” and the “have-nots.” The private universities such as SMU, TCU, Baylor, and Rice could not compete with the powerhouse public universities like The University of Texas, Texas A&M, Texas Tech, and Arkansas that had an advantage from their names alone. The smaller universities had to find a way to balance the recruiting playing field. Many boosters attempted to do this by paying the better athletes to sign with the boosters’ school in hopes of winning a national championship and bragging rights. Operating with misguided loyalty, wealthy alumni who contributed to this scheme at times became important, though unofficial and unacknowledged, parts of their universities’ athletic programs. In the most extreme case, SMU suffered the “death penalty” for repeated NCAA violations. But even though “a program could be shut down if it was found guilty of major violations twice within a five-year period,” it continued cheating while on probation because it felt an obligation to honor its “contracts” with athletes already on campus – and perhaps also because it assumed no one would suspect a sanctioned university to continue its wrongdoings. Such defiance illustrates how under-the-table competition in the battle for signing football players had become a way of life in some SWC schools. SMU was the most penalized university in the SWC, with a total of 14 sanctions, most of them due to behind-the-scene dealings of boosters. Dallas, home to SMU, became the new hotbed for real estate and oil in the 1970s. Most of the high-powered lawyers and bankers had gone to SMU and grown tired of their university coming in last in the conference. The biggest booster was Sherwood Blount, a Dallas real estate developer, who had played football at SMU from 1959 to 1961. He was linked to a slush fund that paid 13 SMU football players $61,000 over two seasons, and the NCAA banned him for life from any association with the SMU athletic department. Most of the sanctions prevented schools from playing in post-season bowl games with the exception of the Cotton Bowl, which always included a SWC team. This cost the sanctioned universities and the SWC a lot of money because the payouts that would have gone to the SWC were redirected to other universities in other conferences. While the boosters and schools hoped that paying players would improve their chances of winning a championship, the plan backfired because their schools lost the chance to compete in the championship bowl games they so desperately wanted. In addition to limited media exposure caused by sanctions, the schools were not always the only game in town. 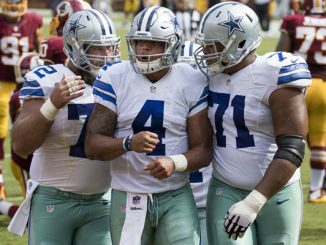 TCU and SMU stood within an hour of the Dallas Cowboys; Rice and the University of Houston pulled from the same fan base as the Houston Oilers. Over the decades, the emergence of the Dallas Cowboys and Houston Oilers robbed the SWC’s four schools in Dallas/ Fort Worth and Houston of their game-attending fan base. One of the major reasons for the break-up of the conference was the departure of the University of Arkansas to the Southeastern Conference in 1991. Arkansas’ departure meant the SWC lost its only media market outside of Texas. The all-Texas conference drew only regional interest and smaller crowds, which limited the schools and the SWC’s media contract negotiations. After Arkansas departed, the revenue that each SWC university averaged fell by about $1 million compared to the SEC. The diminishing revenue stream caused attendance to continue to fall and weakened performance on the field. Although the SWC had strong teams until the end, none of the schools remained in the national championship hunt. The final seven SWC champions from 1989 to 1995 failed to win their bowl games, which added to the conference’s losses. In 1996, the SWC officially disbanded and the teams dispersed and their fans followed. The University of Texas, Texas A&M, Baylor, and Texas Tech joined the schools in the Big Eight to form the Big 12 Conference. SMU, TCU, and Rice joined the Western Athletic Conference. The University of Houston became a charter member of Conference USA, which formed with the merger of the Metro Conference and Great Midwest Conference. Since then, these conferences, too, have realigned multiple times leaving one to wonder if the long-standing powerhouse conferences are a thing of the past. Payments to student athletes were rampant in the SWC, and the NCAA was ineffective in stopping the illegal activity. The problem became difficult to contain and too big to fix. Schools and conferences have yet to find a way to distribute or share the revenues generated by sports programs to level the playing field with regard to recruitment for small and large or public and private institutions. Today one need look no further than the Longhorn Network to see the inequities created by the massive sums available to universities with large media markets. Although not the only conference to break the rules, the SWC remains a symbol of the problems with NCAA football.